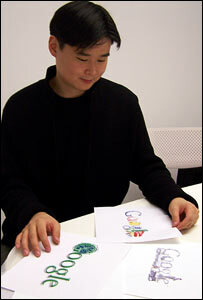 Dennis Hwang, the man behind the famous Google logos created for special occasions, talks to CNN. "It's always a fun kind of challenge to incorporate the logo into the design." Some logos are just funny (like the New Years' logos), others have a message (like the logo for the Earth Day), while a small part of them are simply brilliant (Braille logo). Dennis Hwang's creative logos have been expressing Google's playful spirit. For Piet Mondrian's birthday, Hwang transformed the Google logo to emulate the artist's signature style of using colorful blocks. For Claude Monet's birthday, the logo has been turned into a dreamy watercolor, complete with floating lily pads. While he sometimes made people happy (like when he made a logo for National Library Day), some webmasters were unhappy to see their site down because of the huge traffic generated by Google. If you click on the special logo, you'll be sent to the search results for a query related to that event, like "national library day". The first result for that query, that usually had 1000-2000 visitors a day, suddenly has a couple of millions curios visitors. "It didn't cause any server problems or anything. It just took me a while to track down what was happening. You sort of come in, you turn on your server and look at your stats and they're wildly inflated, so you then have to do some detective work," says a site owner. Dennis Hwang's favorite logos are those celebrating the birthdays of Michelangelo, Picasso, and Van Gogh. Here's the complete list of logos. If a logo changes every day, is it still a logo?